It's not only Old MacDonald who has a farm, you know. Hounslow has one too. E-I-E-I-O. At 29 acres, Hounslow Urban Farm is the largest of all of London's city farms. Animals include pigs, goats, cows, ducks and geese, among others. The farm welcomes all visitors, especially those who live in urban areas and might not otherwise have the chance to see and have contact with farm animals. 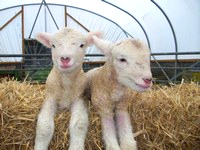 Hounslow Urban Farm can be a great education for children of all ages, as well as a lot of fun. The farm is also known for its rare breed animals, and its work helping to prevent them from dying out. Should you or your child be on the hunt for a pet, Hounslow Urban Farm will be able to help. Banish from your mind images of driving home with a goat sitting in the back - the farm also has smaller pet-type animals, such as rabbits and guinea pigs. What sets Hounslow Urban Farm apart from other similar farms in London, besides its large size, is its popular pig racing events. These take place every weekend, as well as during school holidays. It makes horse racing seem like old hat. Paved walkways around the farm make it easy for those turning up with a pram or pushchair. Besides the animals, there's also a children's playground, an area for picnics, an information centre, and a shop and cafe. Why? Because you haven't lived till you've seen racing pigs. When: Dependent on time of year. Approx. 10am to 5pm. Check website for the latest information.